paris breakfasts: Put A Macaron On It! I'm making BIG plans for new Macaron decor to go with the edition limitee Pierre Herme Paris poster. These macaron Taboret Gourmand par Serge Mansu for Taillardat are tres adorb but may not fit my budget post-Paris(1650 Euros). I could always try my own macaron furniture designs. Macaron pillows are a must! 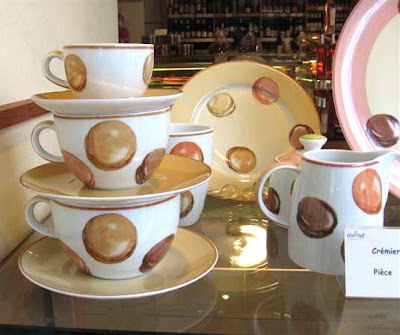 Love love love Lenotre's macaron cups. I have one only so far. Or I could make more mugs at Zazzle. Marc Jacob's Macaron splash is a must spritz. Macaron aprons? Oui bien sur! 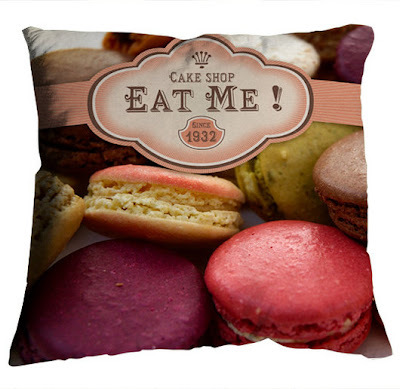 More macaron stuff at Zazzle. I'll make more once I get home! My own macaron-making machine - must-have in my macaron make-over non? Then I'll have to do more than just climb stairs hourly. How about this figue macaron-colored outfit of YSL to exercise in? How fun is your furniture designs! scampi & the cats think macaron pet beds would be great too! we are dazzled by your zazzle offerings! an't wait to see more offerings when you return! This post pushed me over the edge. I'd love to see a room full of your macaron furniture! I love your sketch of the double-macaron chair! How cute and comfy would that be? Ah, two days of macaron posts on PB - it doesn't get any better than this!! Except maybe if I had some macarons to eat ... and sit on (love that furniture design!). Ditto on the fantastic furniture. That chair with the green macaron back is impossibly chic and cute. Don't you think that a tea salon in Paris or a macaron patisserie would look great with seating designed like that? Maybe you could propose it, and then go into furniture design! I love the sketch of the chairs - and your watercolors! Beautiful! When it comes to your mac posts - please super-size me! This post reminds me of something you and I shared, on one of your jaunts to Maine, Carol. Do you remember the car that was completely covered in real seashells? How about doing the same with Macs?! It could be a "Happening." are you sure it was moi with you on the sighting of the seashell car? oh la la! loving that pillow!! great photos of one of my favorite things about paris. a bientot! I love love love your blog. Thanks so much for all of your beautiful words and pictures. I went to Paris for the first time last year and now I am obsessed by all things Paris.